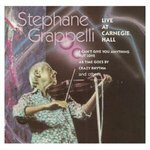 "Stephane Grappelli - Live at Carnegie Hall (CD)" by Stephane Grappelli, Diz Disley et al. Contributing Artists: Diz Disley and John Ethridge, acoustic guitars; Brian Torff, bass. Recorded April 5, 1978, Carnegie Hall, New York City. I can't give you anything but love (4:20) -- As time goes by (3:59) -- Crazy rhythm (4:43) -- Golden green (3:03) -- Chattanooga choo choo (2:29) -- Blues in G for B.T. (6:55) -- Nuages (6:32). Grappelli, Stephane; Disley, Diz; Ethridge, John; and Torff, Brian Q., "Stephane Grappelli - Live at Carnegie Hall (CD)" (1978). Visual & Performing Arts Faculty Music Gallery. 30.